Saint-Gobain Weber has launched high performance weberend one coat dash, a one coat render that can receive a dry dash finish without the need to apply a base coat or a second pass. Designed to achieve a durable and weather resistant finish weberend one coat dash is especially suitable for the challenging Scottish climate where dash finish is commonplace. 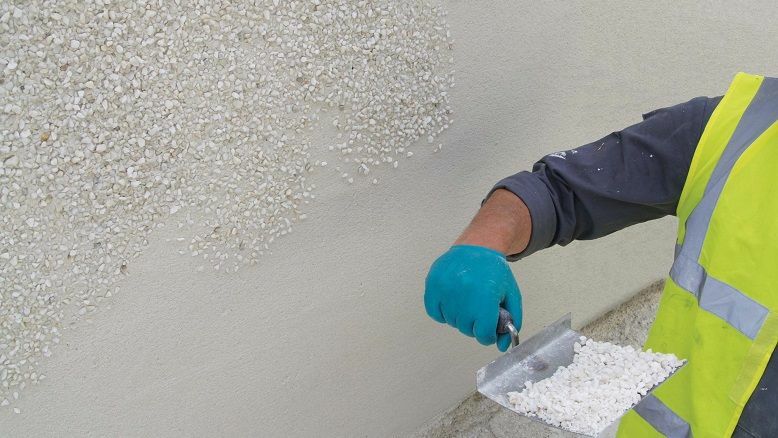 Suitable for brick, blockwork, concrete, natural stone and clay substrates weberend one coat dash can be applied and finished on the same day, avoiding the drying time associated with a traditional two coat system typically of three to seven days. The use of weberend one coat dash allows faster application, reduced programme periods and improved onsite efficiency. Onsite preparation is quick and easy requiring only the addition of water to the factory-blended, through-coloured render mix. It is suitable for application by hand and by spray render machine which will speed the process further. When applied at 16mm thickness coverage is approximately 1m² per 25kg bag. In many circumstances it is possible to apply the total thickness of weberend one coat dash in a single pass dependent upon criteria such as construction alignment, suction and mechanical key offered by the substrate. weberend one coat dash is factory produced for consistency of proportioning and available in three key colours: white, cream and buff. For more information about this product, or for technical support including award winning training courses, please contact Saint-Gobain Weber on 08703 330 070, or visit www.netweber.co.uk.